Sometimes, on rainy days especially, it is hard to tell the difference between mud and poo. While navigating a public transit system, however, you are encouraged to err on the side of caution and assume that any brown substance on the ground is the latter. Don’t be a dope, vote! This message is brought to you by a concerned commuter. 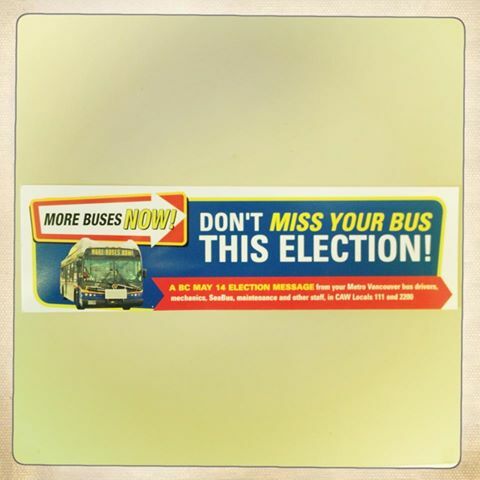 For more information, visit http://www.morebusesnow.ca/election. Tired of missing your bus or feeling more like a sardine than a commuter? You have a chance to vote for better public transit in the BC election today. The BC New Democrats say they will re-direct millions in carbon tax revenue to increase funding for public transit and improve service as a practical response to climate change. The choice is yours, but the results for public transit over the last 12 years under the BC Liberals is clear – there are no more buses. For more information, visit www.MoreBusesNow.ca/election. If you are an old man who smells like he’s most certainly carrying a large quantity of marijuana and is visibly toting a bag of chips, don’t walk anywhere alone – in the Greater Vancouver Area, especially. Further to this warning, do not, under any circumstances, also pull a wad of $20 bills out of your wallet – numerous times, as you sit, reeking, on a SkyTrain. Although it has long been a recognized snack meat, a recent study reveals that one should never have a nibble (or a gobble) of garlic sausage before taking public transit. Doing so has been found to be hazardous to the health of fellow commuters. Vancouver commuters are still reeling from the threat of a natural disaster today, after a 7.7 magnitude earthquake hit the West Coast off the Haida Gwaii islands on Saturday night. “Do you think a tsunami could hit SFU [Simon Fraser University],” a young man asked his friend at a mountain-top university bus stop early Monday. “Well, there are bears here,” the first young man added. In unrelated news, in case anyone missed this news flash 20 years ago, we are repeating it here, today, as a public service announcement: Wearing half a bottle of CK One is no longer fashionable. On a related note, brushing your teeth is.